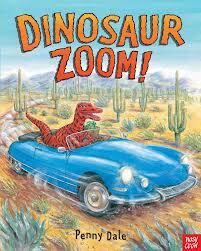 Every child loves Dinosaurs and Dinosaur Zoom! will not disappoint. From the toddler to the early reader this book will have them asking you to read it again and again. Dinosaur Zoom! is a delightful story that sees different types of Dinosaurs zooming, splashing, brmming, chugging, rrrrmming, bouncing and beeping their way to a very special event. Where are they going? Why are they in a hurry? The use of descriptive words and large font make this book appealing to all ages. The beginning reader will love to zoom their way through this easy to read and easy to grasp book that features large colourful illustrations that enhance it’s appeal and wonder. I shared this book with my 5 year old who insisted we read it again the following night. After reading the story we enjoyed sharing the pictures and labels of the types of Dinosaurs on the inside cover. Of course I stumbled my way through the pronunciation of the Dinosaur names whilst miss 5 laughed at my silliness and pronounced them with ease. Turning to the back inside cover we were able to discuss the different types of transport used by the Dinosaurs and compare and label their size, structure and use. Dinosaur Zoom! by Penny Dale is a simple yet entertaining read which uses a topic that all children become fixated with at one stage or another in their early years. I will admit that at first glance my thoughts turned to of “not another Dinosaur theme” but those thoughts were soon forgotten as we found ourselves bouncing to the rhythm of the words from page to page. Our copy was a beautifully presented hard cover book but Dinosaur Zoom! is also available from www.allenandunwin.com in board book and soon to be released paperback, which includes a free audio reading. This is a book that definitely shows an understanding of the world of children’s literature, laughter and the magic of sharing. Dinosaur Zoom! by Penny Dale is a book worth considering when building a book shelf of quality books for any child. Dinosaur Zoom! follows Penny Dale’s previous book Dinosaur Digs!